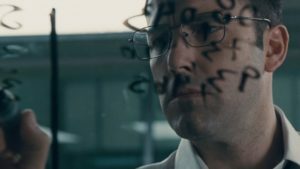 Like The Accountant’s hero, Christian Wolf, my review of the film is neither wholly good or bad. I immensely enjoyed the movie and consider it a step forward for the autism community becoming more understood by the general public. As an autistic person myself, I want to add my perspective. First of all, I love the two primary themes: victimhood is a choice and autism brings powerful gifts that our society needs. I appreciate the use of the “super hero” archetype to characterize the unique abilities of autistic people, which is far better than the “retarded” or “freak” archetypes. I recognize that much like the freak perspective, the super hero role still creates a sense of otherness. But I know firsthand that feeling other is nothing new for any autistic person. I prefer this film’s holistic representation of an Aspie that is superior in certain areas while challenged in others. Most criticism of this movie centers around the claim that it portrays autistic people as deviant, separate, inhumane and violent. I saw nothing inherently wrong with the Christian Wolf character; I saw a brilliant, well-intentioned man doing his best in a society that was not built for him. His violence is a result of his childhood trauma, not his autism. His non-autistic brother is just as deadly, which stems from their shared childhood experience, not their neurology. There’s also an ongoing meme that (non-autistic people) should never try to tell a story about autism, but I disagree. The book Neurotribes by neurotypical author Steve Silberman is one of the best books on autism I’ve read, and he’s been harshly judged for discussing a topic that doesn’t directly affect him. I applaud any neurotypical person who puts their energy and creativity towards telling our story. I call these people allies, and the last thing we should do is punish an advocate who sticks out their neck in a conscious, well-intentioned way. Obviously, the film’s director, Gavin O’Connor, did careful research to make his portrayal of autism accurate and respectful. The victimhood discussion is a tricky one. I believe that the biggest thing holding back the autistic community is the prevailing victim story. As a trainer and coach of fellow Aspies, many of my clients have a deep-seated belief that they’re broken, disabled, or cursed. I see parents weeping over the diagnosis of their child like it’s a horribly unfair tragedy that is ruining their lives. I will be the first to tell you that there are very real challenges autistic people and their families face, and that there are systems and people in the dominant culture that harm us. However, it is our choice to see ourselves as victims and spend our energy complaining, blaming, and living life “despite” our condition. I advocate choosing to see ourselves as empowered and recognize that all challenges are opportunities to become stronger. We can take steps to lessen our challenges and change societal barriers while simultaneously accepting that we are perfect just as we are. I look forward to more powerful portrayals of my fellow Aspies. And much like the evolution of media images of characters from other marginalized groups, I expect to quickly see movement away from stereotypical and deviant, to diverse, nuanced, and brilliant. I welcome The Accountant as a step in the right direction.